Citric Acid, Natural Flavors (Pineapple, Passion Fruit), Sucralose, Silica, Bitter Blocker, Flavor Sweet, Fd&C Yellow Lake #5 15-19%. This product is only intended to be consumed by healthy adults 19 years of age or older. Before using this product consult with your physician if you are using any prescription or over the counter medication or if you have any pre-existing medical condition including but not limited to: high or low blood pressure, cardiac arrhythmia, stroke, heart, liver, kidney or thyroid disease, seizure disorder, psychiatric disease, diabetes, difficulty urinating due to prostate enlargement or if you are taking a MAOI (Monoamine Oxidase Inhibitor) or any other medication. Discontinue use and consult your health care professional if you experience any adverse reaction to this product. Do not exceed recommended serving. Do not use if safety seal is broken or missing. KEEP OUT OF REACH OF CHILDREN. Citric Acid, Natural & Artificial Flavors, Sucralose, Silica (anti-caking). Increase athletic performance, enhance acute mental focus and experience the purest, cleanest form energy like never before withVEX! When you take a good look at the pre-workout supplement category, one thing quickly becomes clear – it’s a category that’s over-flowing with products that are all pretty much the same. You have stimulant-heavy pump products that all have one thing in common – hype. Every one of these products promises to be the “next big thing”, yet once you’ve read the label, what they really are is just the same old thing in a shiny new package. Isn’t time for a bold, new pre-workout? Isn’t it time for a pre-workout to step up to the plate and break the mold? That time has arrived - introducing VEX by Alpha Pro Nutrition! VEX is NOT just another pump and stimulant product that’s long on hype but short on effectiveness. VEX is a cutting-edge pre-workout that will take the category to a brand new level! Of course, energy is the key to any great pre-workout and VEX is no exception – but that energy needs to be explosive as well as long-lasting – and not merely based on CNS stimulants. This is where VEX breaks new ground – not only does VEX offer CNS stimulants designed to provide fast acting, long-lasting, energy, it also gets down to the cellular level where the energy that propels your muscles through your toughest workouts happens – the production of ATP! This is the energy system that fuels muscular contractions – the more ATP your body can produce, the better your workout will be. It may be helpful to provide a quick reminder of how the ATP system works – in this day and age of high-powered CNS stimulants, this essential energy “currency” tends to be overlooked. It’s crucial to understand that ANY muscle contraction or exertion of muscular force happens because of ATP. Three systems are responsible for the production of ATP: the ATP-PC system, the glycolytic system, and the oxidative system. ATP provides energy that is rapidly used up – think seconds, not minutes. It is therefore depleted quickly - the take home point here is that ATP must be constantly replenished if continued muscle contractions are going to take place. VEX creates insane energy, focus and concentration – but it also breaks new ground by promoting continued ATP production to help power you through your most intense training sessions! How does VEX do this? By featuring an exclusive combination of Glucogenic Amino Acids! What are Glucogenic Amino Acids and How Do They Create Energy? They are named glucogenic because they can produce glucose through the process of gluconeogenesis, which is a metabolic pathway (or, series of metabolic steps) that results in the generation of new glucose from non-carbohydrate sources. In this process, amino acids form glucose through degradation to pyruvate, which is an intermediate in the Krebs cycle, also known as the Citric acid cycle and one of the key energy systems of the body that produces ATP. The key point is that as you tire near the end of your workout, these aminos step in when your body has depleted most of its glycogen stores and can supply as much as 18% of your energy needs! Therefore, when you train, your body is able to continue to manufacture ATP – remember any muscular contraction happens because of ATP – so this means you can hit those tough reps at the end of your sets, stimulating more growth! This means you can train longer and harder – getting more out of your workout. Here’s the thing with training and this is why VEX promotes the use of glucogenic amino acids for continued cellular energy while you work out – the physical process of training is catabolic; it depletes glycogen stores and tears down muscle tissue, not to mention the destructive catabolic hormone cortisol is released ( this hormone is released in times of mental or physical stress – such as intense workouts). The longer and harder you train, the more your stores of cellular energy are used up and you hit the wall; your workout is essentially over, whether or not you want it to be. What if you could extend your workout and hit those last, growth producing reps? You know - the reps that are the difference between a good workout and a great one? 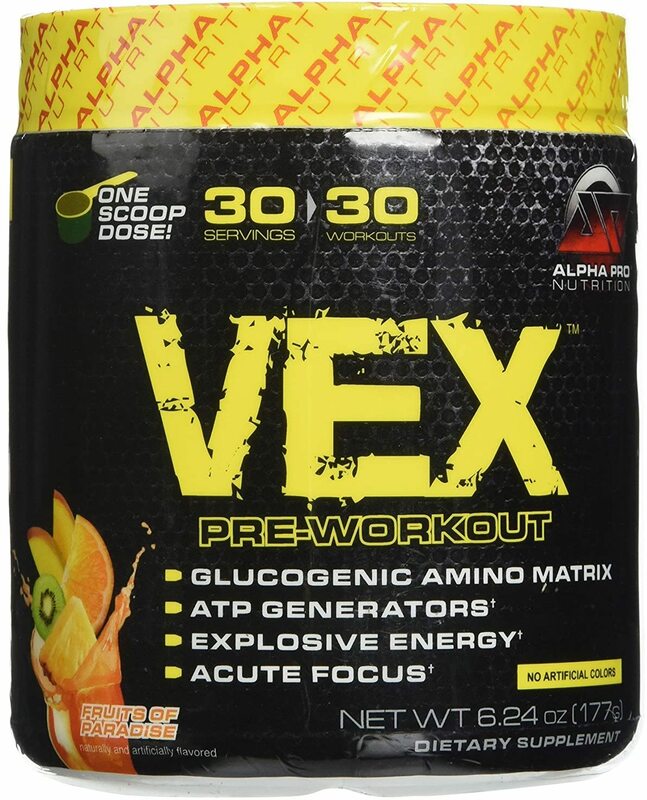 It’s because of renewed ATP production via the use of glucogenic amino acids that VEX gives you the cellular energy you need to hit those key reps and sets - and you will find that there’s no other pre-workout quite like it on the market today! Structurally, glycine is the simplest or smallest of all the amino acids, it’s classified as a non-essential amino acid, and considered to be a glucogenic amino acid as well, due to its role in the conversion of glucose to energy. Additionally, the body uses glycine to help construct RNA and DNA strands—the actual genetic raw material that’s required for cellular formation. It also can prevent the breakdown of muscle tissue by increasing natural levels of creatine, which, among other functions, is also involved in the ATP system of energy. This is an acetylated analog of L-glutamine that absorbs faster and has more pronounced effects than standard Glutamine. Although Glutamine is classified as a non-essential amino acid, is the most dominant amino in muscle tissue and has earned quite a reputation as a potent anabolic/anti-catabolic amino acid. It is also converted by the body into glucose, thereby creating more ATP to fuel muscular contractions. As you can see, VEX features an exclusive combination of glucogenic amino acids triggered by taurine– this combination was designed to work synergistically to promote increased cellular energy – the energy your muscles crave during a tough, intense workout! This has become a very well-known supplement, thanks to a particular TV personality. Green coffee beans are yet to be roasted coffee beans. When the beans undergo the roasting process, levels of the active ingredient, chlorogenic acid, are dramatically reduced. Therefore, green coffee beans will have a much higher level of chlorogenic acid than typical roasted coffee beans. Chlorogenic acid, along with its well-publicized fat loss effects, help your body release glucose, thereby enhancing the effects of the glucogenic amino’s found in VEX. Caffeine Anhydrous is basically the powdered form of caffeine, and is common to many supplements. The term “anhydrous” is a chemical term that literally means “without water,” in this form it is considered to be more concentrated and better absorbed. Caffeine Citrate is the combination of caffeine anhydrous, citric acid and sodium citrate. It functions the same as standard caffeine; the major difference is that it’s much faster acting. You can see that the caffeine complex in VEX combines fast acting versions with longer-lasting versions, improves overall absorption, and does not promote the typical crash associated with many of the leading pre-workouts. This means you get quick, explosive, long lasting energy! This is an alkaloid substance that’s commonly found in chocolate, among other foods. It’s part of a class of substances referred to as methylxanthines, this means it’s chemically related to caffeine, among other stimulants. The major difference is that the stimulant effects are much milder than those of caffeine, which ultimately means it does not cause the jitters that can be typical with the other leading pre-workouts. As you can see, VEX has taken a unique twist on pre-workouts and created an innovative formula designed to do much more than just give you quick energy! VEX is a revolutionary pre-workout that will take the category to a new heights. It’s innovative for what it contains but also for what it does not contain – it’s creatine-free and beta-alanine free. Why? Creatine is certainly a time-tested and proven compound to be sure, but it’s a very individual compound that many users prefer to cycle. If it’s in your pre-workout, you can’t cycle it. 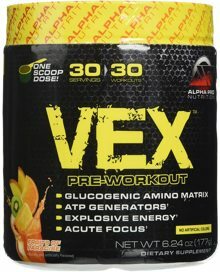 VEX also does not contain Beta-Alanine, another proven and popular compound. Why? Many users complain of the itchiness it causes - why use a product if it promotes side effects that distract you from your workout?